The “Purification for Central Air System” V-PAC (PCO) systems install in the air handling unit (10 ton and above) of the HVAC system for your property. A simple to install system essentially consisting of an array of germicidal UV lamps (V-MAX GRID™ system) in close proximity to one or more arrays of PCO panels. An optional carbon filter bank is available downstream of the PCO filter bank as needed. It is available in a variety of configurations depending on concentration levels, percentages of outside air, and desired results. A design team will assist in tailoring your system for the specific end-use application. 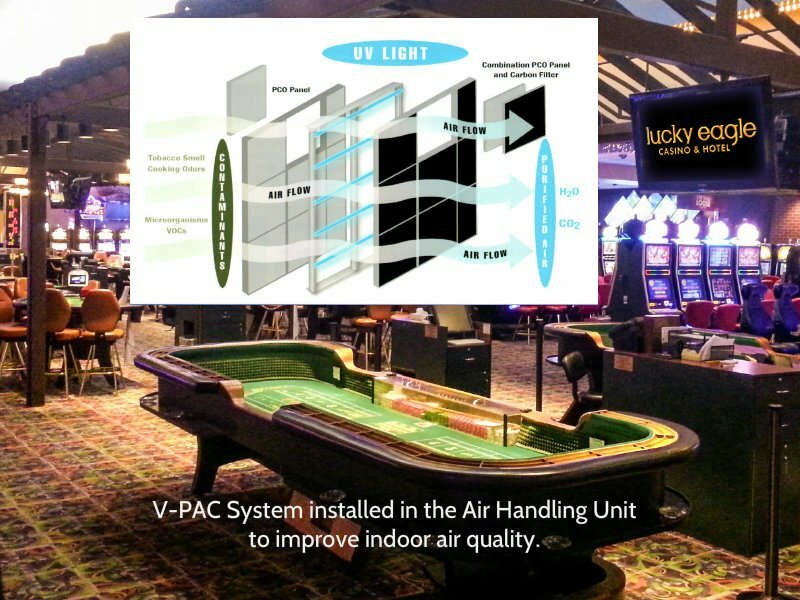 “The V-PAC™ system has taken our clean air and energy efficiency initiatives to entirely new levels,” said Jeff Young, Lucky Eagle Director of Facilities. “Our guests and team members noticed the difference almost immediately following installation. How does the PCO technology work? PCO systems utilize a UV lamp and a titanium dioxide photo catalyst to create oxidants that destroy gaseous contaminants. 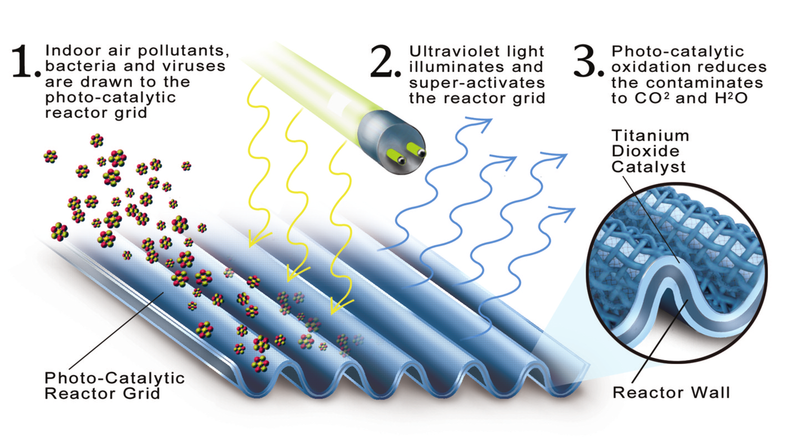 When the photo catalyst is irradiated with UV light of a certain wavelength (254-365 nm), a photochemical reaction takes place and this reaction, called photo catalytic oxidation (PCO), converts organic pollutants into carbon dioxide and water. Pollutants, particularly VOCs, are preferentially adsorbed on a catalyst surface and oxidized in this process. The process is diagrammed below. 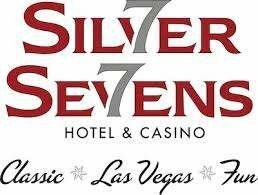 What will is cost me for my casino? For a PCO system, whether it is a “self contained” or “purification for central air system” application, a good estimate is $1 - $2 per sq. ft. We offer a range for budgeting purposes as many factors will affect the price such as activity and occupancy, contaminants, height of the ceiling and amount of ventilation. air quality. During your trial, we can look at your property and figure out the most cost effective way to use PCO to get the indoor air quality results you need. How do I get more referrals and test results? Contact us and we will be glad to send you more case studies and referrals to help you towards improving your indoor air quality. Below are some preferred properties currently using PCO technology to improve their indoor air quality.